Wanderlust offers events and festivals across the world to transform your mind and body. Join in for a day or weekend to center and challenge yourself. I was just talking about self care last week. It's so important to take care of yourself as you run around trying to take care of everyone else. You know the drill about the oxygen masks. You have to put your's on first before you can help anyone else. So I have another great way for you to practice self care. Take yourself to a Wanderlust event. Wanderlust is a global yoga lifestyle company. They put on some really cool events all over the world, and they'll be returning to Santa Monica again this year, along with their signature "mindful triathlon." 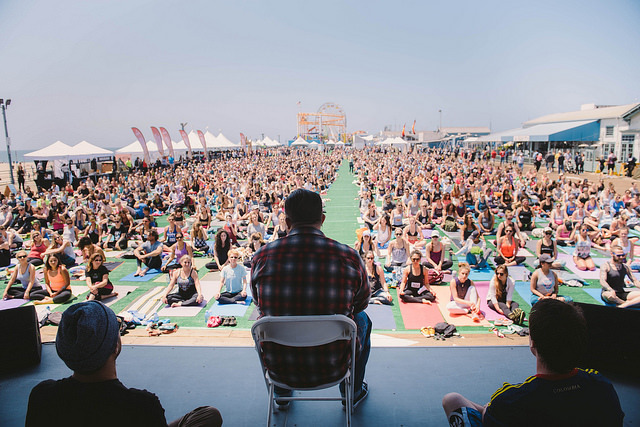 The Mindful Triathlon starts with a 5-kilometer run, or walk, followed by an amazing group outdoor yoga class right on the Santa Monica Pier. It concludes with a guided meditation. I might be able to medal in this, but right, it's not a competition. That's the beauty of yoga. You practice where you are, and where you are is absolutely perfect. It could end there but doesn't. Wanderlust 108 as they call these one-day events, also includes aerial yoga and acro-yoga, when the yoga mat might just be too sticky for you. You can also learn about essential oils, get into some tarot card reading, and even get your hula hoop on while listening to some top DJs spin uplifting music. Last year at Wanderlust, I tried my hand, or body rather, at aerial yoga for the first time, and I have to say, I'm hooked. I loved how the hammocks suspended my body for a real release with no joint pain. 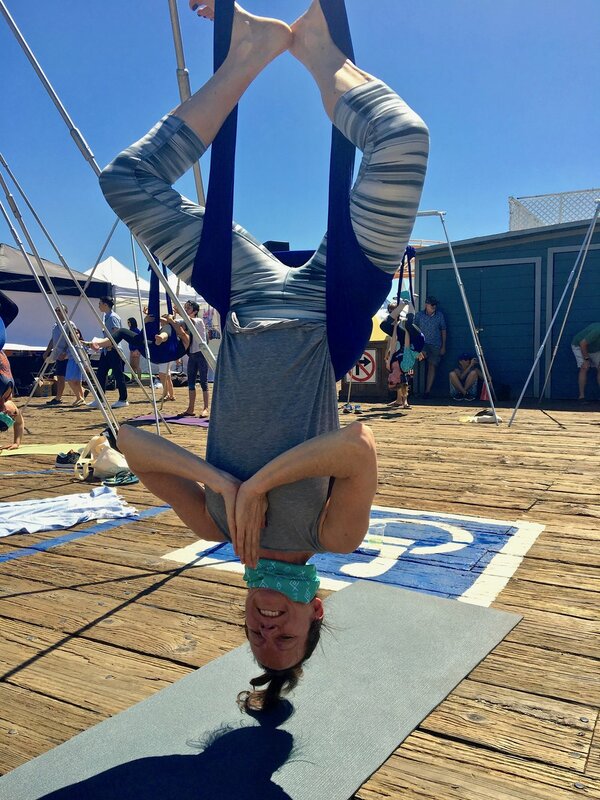 I've already done aerial yoga in LA a few times since the event. There's a full marketplace for jewelry, crafts and clothing shopping, and of course plenty of food to fuel your mind and body, including vegetarian and vegan options. If you don't live in LA, fear not. Wanderlust has events in 60 cities and over 17 countries on 5 continents, so there's bound to be some good vibes near you. Check their website for more info. As if you needed any more reason to attend Wanderlust, $1.08 from each ticket sale will benefit The Global Fund to Fight AIDS with (RED). Talk about extreme care for yourself and others. Check out the link below to see where the closest Wanderlust event is happening near you, and maybe I'll see you at the Santa Monica Pier this year!